On March 19, 1897, The Maine legislature passed a bill requiring hunting guides to register with the state. Maine registered 1316 guides in that Ist year. The honor of receiving the first Maine guiding license went to Cornilia Thurza Crosby, or “Fly Rod”, as she was affectionately known to friends across the country. Crosby first discovered her love for the wilderness when, on the advice of her doctor, she left her job in a bank to seek “a large dose of the outdoors”. This prescription brought her to Rangeley, Maine, where she found work housekeeping in some of the large hotels in the area. She became friends with the local guides, and from them she learned the lore of the woods and the pleasures of camping, hunting, and fishing. In 1886 a friend presented Cornilia with a five-ounce bamboo rod. She became so adept at fly-fishing that she once landed 200 trout in one day. She began to write up accounts of her fishing adventures and submitted them, under the name “Fly Rod”, to O.M. Moore, editor of the Phillips Phonograph. “That’s mighty good stuff!” responded Moore. “Send some more right away” “Fly Rod’s Notebook” became a widely syndicated column appearing in newspapers in New York, Boston, and Chicago, and the new name stuck. 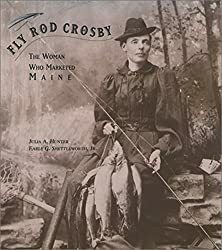 Although she shot the last legal caribou buck in the state of Maine, “Fly Rod” Crosby’s most remarkable and enduring contribution to her native state happened far from the North Woods. In addition to being its first licensed guide, she was Maine’s first public-relations genius. She arranged an elaborate hunting display at the First Annual Sportsmen’s Show in New York’s Madison Square Garden, starring herself, rifle in hand and wearing a daring, knee-length doeskin skirt. Her sensational appearance at the Sportsmen’s Show, together with the popularity of her column, helped to attract thousands of eager would-be outdoorsmen–and women–to the woods and streams of Maine.